Kung Fu San Soo is considered, by many, to be the most sophisticated and complete form of martial art in existence today. In the December 1999 issue of Inside Kung Fu Magazine San Soo is referred to as “Legendary and Devastating… A pure Chinese fighting art that has few equals.” These statements could be considered opinion and many consider them fact, but all agree, Kung Fu San Soo is not a sport. By its very definition, the complete use of a man in the art of hand-to-hand combat, San Soo cannot conform to the specifications of being a sport. Sports are governed by a set of rules. 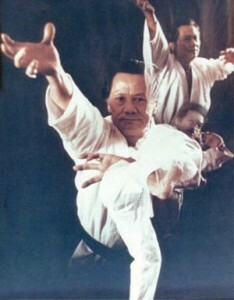 However, if a set of rules were applied to San Soo, a fighter’s techniques would be limited and they would no longer be utilizing the principles of Kung Fu San Soo. San Soo (Tsoi Li Ho Fut Hung) Kung Fu is based on five “families” of techniques: kicks and punches 蔡家 (Tsoi-ga), leverages, throws and joint locks 李家 (Li-ga), pressure points 何家 (Ho-ga), psychology of fighting 佛家 (Fut-ga), and physical conditioning and power 雄家 (Hung-ga). The techniques of Kung Fu San Soo utilize principles from psychology, anatomy, kinesiology (the sum of what is known regarding human motion) and the laws of physics to train the mind and body for combat. San Soo is a martial art, which incorporates these principles including balance, timing, proper breathing and concentration to produce a powerful and effective fighter. Many of the leverage moves find their basis in the principles of physics. Although Lo Sifu never studied physics, he did understand the mechanics of how a body moves, acts and reacts in a given situation. He understood principles of motion many go to school for years to learn, but his education came through experience. There are two keys to the success of a San Soo fighter: first, there is the versatility of the movements. The combinations of blocks, punches, kicks, throws and leverage moves can be altered instantly to respond to any situation a fighter may encounter. Offense is the second key; a San Soo fighter does not fight defensively.